HEPA filtered cleanrooms and standard environmental enclosures are available utilizing modular construction. Typical uses include quality control inspection areas and manufacturing areas. Our services include design and turnkey installation. 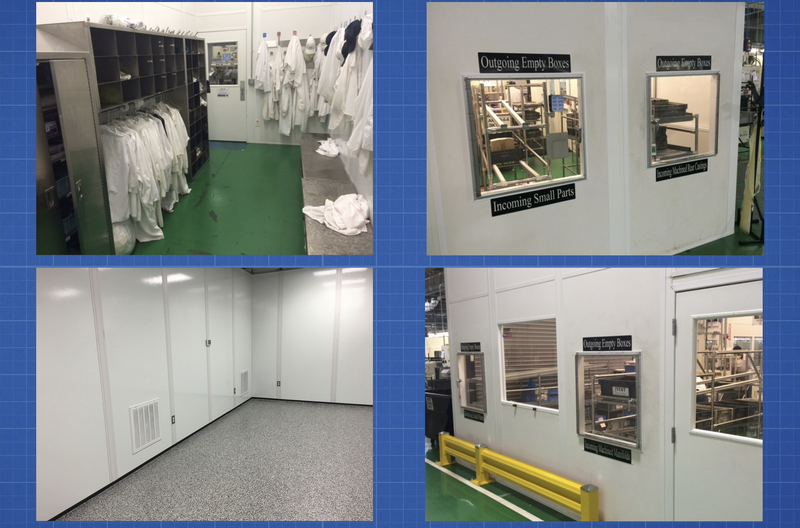 Storage Solution’s modular wall systems are available in a number of panel finishes including vinyl, painted steel, aluminum or a fiberglass reinforced plastic (FRP) finishes that provide environmental control from noise, temperature, humidity and particulates. They can also accommodate oversized roll-up or bi-parting doors to facilitate the movement of large equipment and materials in and out of the controlled environment. The word cleanroom can immediately sound like something more complicated than it really is. Though most might picture a highly sophisticated enclosure with occupants dressed in full containment gowning when they hear the word “cleanroom”, the term can actually take on a variety of meanings.